Sao Paulo: Lewis Hamilton completed a perfect opening salvo when he outpaced championship leading Mercedes teammate Nico Rosberg in Friday’s closely-competed second free practice for this weekend’s Brazilian Grand Prix. The defending three-time world champion, who was fastest in the morning’s opening session, stayed on top with a best lap in one minute and 12.271 seconds, an advantage of just 0.030 seconds ahead of Rosberg. The 31-year-old Briton was satisfied with his efforts, but warned that in the high temperatures with unpredictable weather forecast, he had done nothing more than make a good start in his battle to hang on to the championship. “It’s been a good day,” said Hamilton. “We got through all of our run programmes and the car is feeling really good. It’s pretty tough out there physically right now with the heat as high as it is. Not just in the car but for the guys in the garage too. On a hot day with clouds threatening, there was little to separate the two title contenders, but Rosberg did enough to suggest that even if he does not take the title with a decisive victory in Sunday’s race he will retain the initiative. Rosberg needs to complete a hat-trick of Interlagos triumphs to claim his maiden drivers’ championship, but knows that with a 19-point lead and two races remaining two second places will be enough. He said: “It’s been very hot out there, more so than we expect it to be for the rest of the weekend. As a result, that makes it difficult to fully prepare for qualifying and the race. “Other than that, it was a pretty normal Friday. Our car looks quick, but Red Bull are definitely close. The soft tyre is degrading quite a lot on the long runs, with blistering on the rears. There’s a surprising amount of degradation on the medium tyre too. 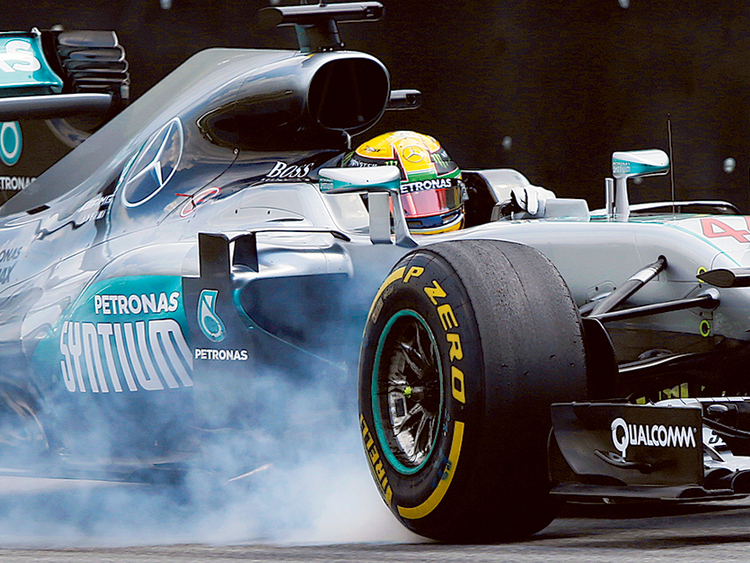 Hamilton is seeking his first win at the Brazilian event, the only race on the calendar other than the new European contest held in Baku that he has not won. Unexpectedly, the Williams team, powered by Mercedes engines, were the second strongest outfit with Valtteri Bottas third ahead of his teammate retirement-bound local hero Felipe Massa. This pushed the Red Bulls of Australian Daniel Ricciardo and Dutch teenager Max Verstappen down to fifth and sixth ahead of the two Ferraris of four-time champion Sebastian Vettel and Kimi Raikkonen. Nico Hulkenberg was ninth for Force India ahead of the two McLaren Hondas of Jenson Button and two-time champion Fernando Alonso. Button, who won the 2009 title in Brazil, said that he believed a rain-hit race — as forecast by some — would favour Hamilton. He said: “If it’s wet, it mixes things up. Lewis knows he’s really good in the wet and can make a big points score. Nico knows there’s a lot more to lose. Alonso’s running ended early due to an electronics problem and in an episode that reprised his frustrations of 2015, when he ended up sitting in a deckchair to watch the action, he amused himself by sitting in a fold-up canvas chair and operating a television camera. Raikkonen was called to a stewards inquiry after the session after cutting across Carlos Sainz’s Toro Rosso at the pit-entry during the session.